Poinsettia House sits on a hillside looking down on the ocean - you can even see fish swimming from the balcony. The views are truly extraordinary - and unobstructed as to our west is nothing but conservation land. Poinsettia House, rented through Marigot Bay Villas, is a true gem ! Just a short walk (two to five minutes) from the house, you find nine restaurants/bars, beach (FREE beach chairs for guests), dive shop, water sports rental, grocery,bakery, small bank with ATM, spa, and gift shops. The location in Marigot Bay makes it ideal for touring the island as it is centrally located; or just sitting back and relaxing your entire holiday. Two bedrooms with bath en suite - each has a king-size bed with fan overhead. Two sitting areas with fans - and full kitchen supplied with everything you need to cook including cookbooks. Off the west end of the house is a sun deck - the perfect place to sit and watch the many boats that daily come in and out of the harbor. The grounds are planted with fruit trees (orange, grapefruit, guava, and lime), - and of course, flowers. Lucianna, our housekeeper, comes in three days a week to clean and will also cook meals for you (extra). Airport transfers can be arranged with our driver, Smalley who meets you at the airport and takes you to Marigot. He arranges for someone to help with bags and takes you to the house. He can also take you on tours at your request (extra). Joe and I are long time New Englanders but moved to Florida in 2002 to enjoy more year round warm weather. We are both 'water people' and so naturally gravitate to the ocean. We live on Anna Maria Island in Florida and enjoy an active life style -- sailng, swimming, beach combing, and lots of socializing! Our family is scattered -- three children and nine grandchildren -- so some of our travels are to visit them. We spend some time every year in St.Lucia to keep the house in tip top shape and then love to travel to other spots as well. We spent our honeymoon in St.Croix and after that, every year, we would choose and visit another Caribbean Island. Many islands later we found our way to the lower part of the Caribbean and decided this was 'our kind of place'. It was more relaxed, a more mixed group of tourists from all over the world and very friendly people. One year we picked St.Lucia and had already decided to buy something somewhere in this general region. We fell in love instantly and after looking in different areas of the island we decided on Marigot Bay where we ended up finding a perfect house for us - simple, Caribbean style, light and bright! One of the reasons we chose to buy on this island was that so much is offered to the tourist, the Lucians are friendly and open their arms to you.There is so much grown on the island in the way of fruits and vegetables. You can just totally relax your whole trip at the house or beach. Or you can zip line in the rain forest, hike the Pitons, take a mud bath at the botanical gardens, tour the Castries market, hike on Pigeon Point -- the list could go on and on! And where Marigot is located about halfway down the western coast, it is easy to reach everyting this wonderful island has to offer. Clear and unobstructed -- great sunsets! Available only to housekeeper but she will do wash for you. My wife and I and another couple from Massachusetts enjoyed a perfect vacation week based from Poinsettia House overlooking Marigot Bay. We arrived on a rainy Saturday night and immediately prepared our first dinner in St. Lucia using the charcoal barbecue. Despite some light rain, we fired up the grill and enjoyed dinner on the porch overlooking Marigot Bay and the lights from many sailboats anchored in the bay. Poinsettia House is perfectly suited for 2 couples, each having their own bedroom and bath. The kitchen is well equipped with dinner ware, appliances, a dishwasher and ample counter space for in home cooking, which we fully utilized. A guide notebook for guests was a valuable resource throughout the week as it provided sound recommendations of places to go and people to contact in Marigot Bay for services or travel assistance. Lucians we met during the week were without exception friendly, warm hearted and alway interested in making our stay enjoyable. Poinsettia House is a perfect space to enjoy as you venture out to learn more about St. Lucia, the island history and the beauty of the island. I highly recommend this vacation rental property. So glad you enjoyed your stay --- first for you and second for your friends ! Do come back and visit soon ! We rented the Orchid House- just up from the Poinsettia and it was awesome. It has the same layout as the Poinsettia House- 2 bedrooms and 2 bathrooms. Kitchen had everything you would want. We did get Smalley to pick us up from the airport and stopped at a bigger grocery store to load up for the week. We ate breakfast and lunch most days in the house and ate dinners out. It is a bit of a hike up to the house(only 5 mins) but good exercise. It is close to everything - tons of restaurants, we went to the Rainforest for Christmas dinner and it was fabulous. Also the Indian place is great across the bay. We bought a weekly pass for the boat- well worth it. And Smalley took us one afternoon to Rodney's Bay- he stopped at the local market, then drove us to the beach, then took us to the Fish Fry - it was so much fun, lots of music, tons of people dancing- I am sure it goes on all night. And we got a driver another day to take us to Sugar Bay- totally beautiful beach - great snorkeling- awesome hotel to have lunch at on the beach. Then we went up to the top and had a drink at another hotel and watched the sunset. And another day we got one of the guys to drive us on their power boat over to a private beach- which was awesome also- great snorkeling also. Elaine was so nice, checked on us a couple of times to make sure we had everything, and she stored our luggage the last day in her place. The people are so friendly. Great spot and would highly recommend. Weather also rocked! Very nice spot and lovely house. well equipped . lot of charm. a good place to visit St Lucia. The house is fantastic in a typical island style, very confortable and very well equipped. Marigo bay is one of best places to stay in Saint Lucia, the view from the house is just amazing. Gardens around the house are also fantastic and the place is very quiet. The stay was very well organized by Elaine, she gives all valuable information to enjoy. This house is warmly recommended, you can go without any doubt ! Words can't describe this wonderful vacation rental! 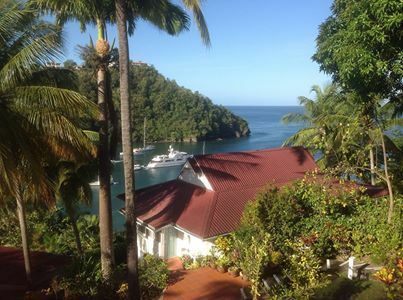 We have just returned from a lovely two week stay at Poinsettia House in Marigot Bay. Everything about this rental is fabulous. When you walk in, the view and atmosphere take your breath away and you feel so lucky to be vacationing in such a beautiful space. The layout was perfect for two couples with bedrooms with en suite bathrooms at each end as well as two living areas. Between these two ends are the well-equipped kitchen and dining area with a cooking island that looks out to the bay. The entire house front of the house is open to the view with no windows, only screening. Then there is a large partially covered deck with a wonderful view of the bay! Elaine is a pleasure to rent from, replying quickly to questions and providing guests with great details about the house, Marigot Bay and St. Lucia. She recommends a local fisherman who we contacted and he caught us a delicious red snapper. We also took a taxi into the Castries market and bought lots of fresh vegetables and fruit to allow us to cook many meals. The housekeeper, Luciana, can be engaged to cook a Lucian meal for you… we did this twice and were so pleased with the meals and her engaging personality. We enjoyed the ferry trip over to town and our daily swims in the Caribbean. Our tours around the island were so interesting, we went to the Pitons and Anse Cochon for swimming and snorkeling. St. Lucia is a beautiful island! We highly recommend this rental. Book it early though, to get the dates you want. We booked almost a year in advance to get the two weeks in March that we stayed. It was well worth waiting for!! We have fond memories of our adventure and our time at Poinsettia House!! We spent an awesome week in St Lucia thanks to Elaine! The Pointsettia House was not available, but Elaine assisted in another house on the hillside. We stayed in Orchid House and throughly enjoyed ourselves. We were 2 couples looking to get away from it all (snow) and this was the place to do just that! Smalley picked us up from the airport with a stop at the market for a few necessities. We toured by land to see the volcano, mud bath, Pitons, waterfall, and rum factory then 3 days by sea with Alex and Benji for snorkeling to the south and touring the north. Elaine's great recommendations of sites, restaurants, and contacts made the trip effortless. Doolittles was our daily stop before heading up the lift for a refreshing beverage and reminiscing the daily adventure. The Orchid House was the perfect relaxing location. The open air concept, tropical breezes and view of the bay were just what we were looking for! Thank you for sharing paradise with us! So glad you enjoyed your stay at Orchid House. With it's open floor plan it is perfect for two couples or just one ! Marigot Bay is a sailor's paradise. At any time of year you can see fabulous yachts and sailing ships from all over the world. But if activity is your thing, a dive shop is nearby; rent kayaks and take a trip up a river to a banana plantation; use one of the sailfish in the bay; swim and snorkel. Within a short five minute ride from Marigot is the rum factory. Or take a hike!